My sister in Jackal Sobeq speaks volumes on having real love for the Gods. Plus, I miss writing. Beloved Jackal Dad, please obliterate the obstacles in the way of my moving forward, and in the way of my Doing and Creating. Kheperu. This took place on September 1. As these things go, perhaps a good time for a liminal experience. Not only was it the start of a new month, but also the start of a new semester. And as such, the day I switched back to my now much more common evening schedule. (I work 2.30pm-11pm when school is in session.) It may not have been the witching hour but that was coming close enough. As more lead up, I am a creature of habit. I almost always take the same route to and from work. While I could take the main avenue near my house which goes directly to the street where I must turn, I skip it because the speed limit is low and there are a lot of lights. My preferred route is of a similar speed limit but fewer lights and a little more wild space. When I would take this route home last year, I occasionally saw foxes and one night, a buck. Much more appealing for me. On the night in question, I didn’t see anything unusual at first. All I knew is I was tired because my body had not had the chance to make the switch to working later into the evening. And like I said, I was probably primed for this. Coming closer to my house, the road I take makes a 90 degree curve. It’s perilous even in the best conditions, and during winter it can take you into a snow mound if you cannot handle the curve. This is the area as I come upon it on my drive home. 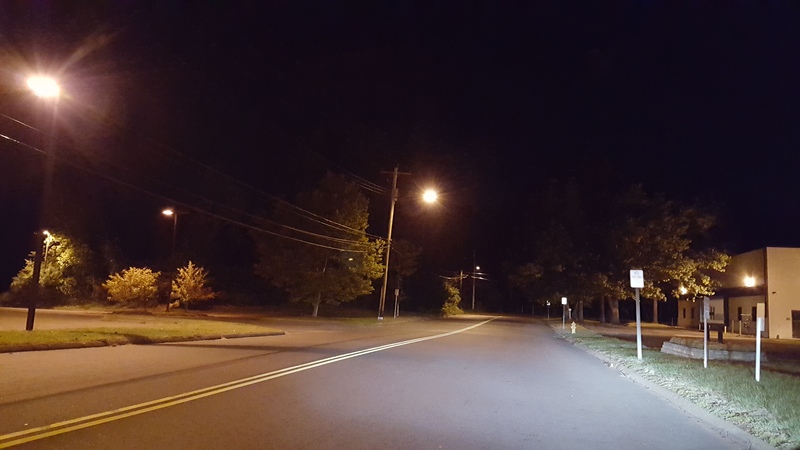 Notice the collection of street lights on the left giving good light to an area of trees. It didn’t look like this on that first night. I came up to this part of the street and it was black. My rational mind says there is no way all those lights were out at the same time, and yet it was black. And in that blackness came another blackness. Coming closer to the curve, for about two seconds, I could perceive and nearly see a large black canine head extending across the road. It was gone by the time I took the curve but I could still sense that otherness of the spirit world as I drove home. Every night since, when that curve first comes into my line of sight, I look at it and it looks as it does in the picture. Even so I do not doubt what I sensed on that night was real. I will admit that my knowledge of black dog legends is low at this stage; my ability to read fast is but a distant memory right now. That Wikipedia article has been a help even in its minimal form, and I am okay with only having the one sighting. It also provided me with an amazing tidbit, there is a black dog legend not far from where I live. And while my “dog” was much larger, the first visit did fill with me joy. Even if the spirit is not a dog in its native form (and how often do we see spirits as they “really” appear?) I don’t mind. I think whatever it was, dog or no, showed itself like that because I would recognize it. And as such moments do, I got to thinking about where I live. Those of you who have known me for a long time know that I had a somewhat nebulous plan for several years that I would move out west. With my mother’s passing and inheriting her house, that is on a burner way in the back. Maybe even off the stove but who knows what the future brings. So I am here for a while now. And for all that I complain about the people here, I do love the land. Even my home, a condo. Despite the management’s and our overculture’s ideas, a fence can’t keep nature out. I share my land with a flock of turkeys across the street because no one told them the fence means do not enter. There are birds aplenty, squirrels, possums, skunks, at least one owl, vultures, and I swear I once saw a kestrel. Not to mention the woods, the grass, the end of the nearby lake creating wetlands. There is much magic and mystery just waiting outside my door, and I know where to look and how to see it. Sarah Lawless did this piece not long after I saw the dog and she hits on the essence of my wanting to stay. I need the green spaces. I need to be areas mostly left alone by human reshaping. I need to see the stars overhead and feel soil under my bare feet. I also need to be near an ocean, which is an interesting family quirk/wyrd. IF you need this kind of space, a little more removed from modern hustle and bustle, look around. There are plenty of smaller towns in the US hoping for people to move. My area isn’t one of them but I think I’ll be okay sticking around here for a while. 1. Two weeks ago I went to a presentation on the Mighty Dead by Chris Penczak. I picked up his book,t he talk was interesting, he mentioned some Traditional craft stuff, and I think I can incorporate some of what he discussed into my own work. The weird part is that in a full room (a good 20 people), I was one of the most experienced practitioners there. The only ones with more experience (at least who spoke up) were Penczak himself and Siduri, and I showed up with her. If I could offer one piece of advice to a seeker, or someone “electic” whow asn’t really sure which direction to go, I would just tell them to stick with something. One thing. Learn it more, and deeper. Let it integrate with the other parts of your life. Sometimes it seems like neo-paganism as a movement suffers from serious ADD. 3. Link editing has begun. Instead of doing it all in one sitting, I’ll update slowly as spoons allow. If you have someting you really really want to see there, speak up!